"A surprising number of people, when I tell them about my book, confide nervously that they think they might be a hoarder, too." This is how Jessie Sholl began her article Trash or Treasure: What Makes People Hoard?. The book she mentioned is called Dirty Secret: A Daughter Comes Clean About Her Mother's Compulsive Hoarding. (3) significant distress or impairment in functioning caused by the hoarding. Are we quite safe then? That’s not how I look at myself. Sholl’s article is a stark reminder of the extent to which I display at least some characteristics of a hoarder. It is something that I was previously unaware of. For one thing, I am certain guilty of “acquisition of, and failure to discard, a large number of possessions”. I pride myself in not paying over the odds for things I like, and most purchases I make are when the items are on sale or when I can buy them second hand. The problem, however, is that the cheap prices seem to give me the license to buy many – simply too many. Take tennis T-shirts and shorts for an example. None of the ones in my wardrobe costs more than USD10, although they are all brandname products which I bought from export shops or in a big sale. The undesirable outcome, however, is that I now have a supply of T-shirts and shorts that will last a lifetime. The cases of my tennis racquets and shoes are similar. So even though it hasn’t got to a stage where my living spaces are cluttered or functioning is impaired, a situation in which I have purchased much more than I need is not a healthy one at all. 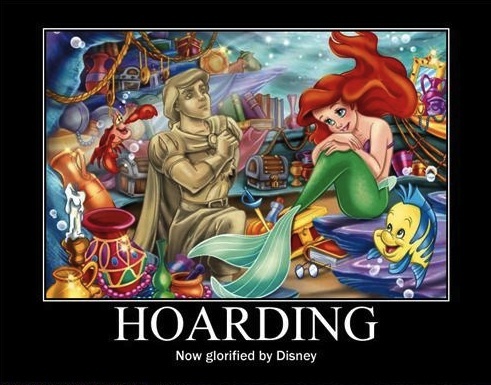 I may still be just a “collector”, but according to Sholl, it is possible that a collector may turn into a hoarder. "Hoarding is often set off by a trauma, though symptoms of it appear earlier, sometimes going as far back as childhood,” she wrote. She talked about how her own mother, who was always unorganized, lackadaisical about cleaning, and certainly an over-purchaser when she was growing up, became a true hoarder when her boyfriend died. Whether or not there will be a tragic trigger that will turn me into a hoarder, I should try to cut out the habit of over-purchasing.